Located in the Andaman Sea, Koh Tarutao as a national park consists of 61 islands. Seven of these islands are large and have accommodations for you to consider. These islands are : Tarutao, Adang Rawi, Lipe, Klang Dong and Lek Islands. The rest of the islands are much smaller. The Tarutao island was used in the early forties as a penal colony. It held normal and political prisoners away from the mainland. Now however, all that remains, are the memories and the structures of this once, dark history of the island. The islands and its surroundings was declared a National Park in 1974, and one very promising attraction that you should not miss are the crocodile caves and the Hin Ngam beach of the island. Lipe on the other hand, a part of the Tarutao islands, under the Adang archipekago is a small island of about 4 kilometers, but functions as the most essential island in the Adang archipelago, because it is the only island which has a permanent settlement. This is where you can find the sea gypsy village. Accommodation and activities are available in this island and they also offer boat transfers in and out of the Adang Archipelago. 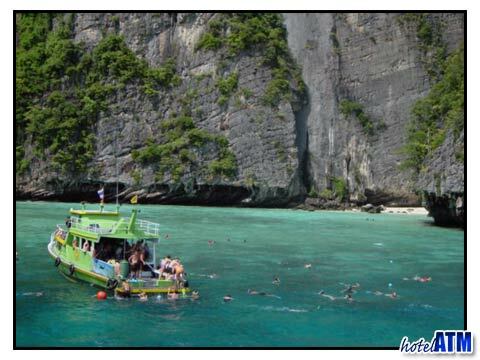 Getting to Tarutao and Lipe Islands from Phi Phi will take about a couple of trips to achieve. Tarutao will act as the main link to its other islands, so your first goal is to reach Tarutao prior to reaching its islands. The start is always down at the main Phi Phi Pier where you get the 2pm ferry to Koh Lanta. Boats from Lanta to Lipe, are also available but only on a seasonal basis. 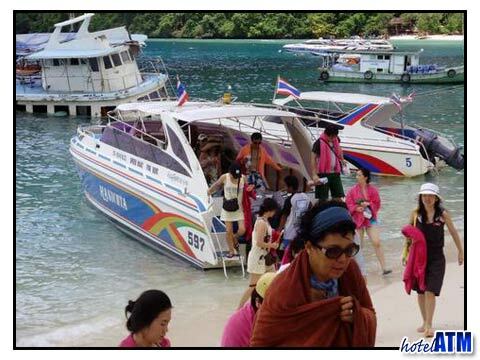 In Low season get a joint ferry and bus ticket and take the the 9am ferry to Krabi Town. On arrival you are shown the to the 11am bus to Had Yai . From their you change to the bus to Pak Bara Pier in Amphoe La-ngu. The ferry leaves from Pak Bara to Tarutao leaves at 9am and 10.30 am so you will need to stay in Pakbara a night. The ferry takes 1 hour 30 minutes. It is in Tarutao that you can get boat rides to, its other islands. One of the most exciting parts in the boat trip from Tarutao to Lipe is that when you arrive in the coast of the Adang Archipelago, you will be greeted with an armada or a group of long tail boats and you guessed it right, you will have to transfer to boats, that will take you to the individual islands of the Andaman Archipelago. The fun in getting to Tarutao and Lipe Islands from Phi Phi is, again the adventure that you get when actually traveling to these places. I personally enjoyed the boat transfers from the ferry to the long tail boats, near the Andaman Archipelago. Accommodation prices for Koh Lipe are between 180 and 3000 Baht but most are around 500 Baht mark. These simple ones do not have hot water.